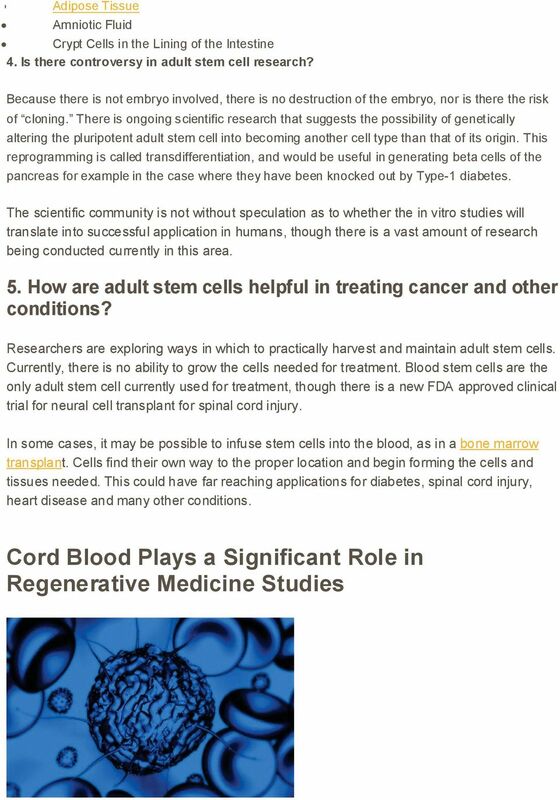 Download "5 Frequently Asked Questions About Adult Stem Cell Research"
3 For years, stem cells from bone marrow have been used in medicine, primarily for the treatment of cancers, immune disorders, and blood disorders; however, there is a new source of stem cells that is currently being exercised in the world of regenerative medicine human umbilical cord blood (HUCB). HUCB is a well-received source of stem cells for any disease where stem cell transplants are considered standard therapy. Researchers are actively searching to find a breakthrough using stem cells from HUCB because of their immediate benefits as well as their availability. The collection process of HUCB upon birth is absolutely painless and actually very simple once a baby is born, the blood is taken from the umbilical cord by way of a syringe. The blood is then promptly placed in a labeled bag and sent to a blood bank of the parents choice where it is stored indefinitely. Stem cells collected from HUCB are also much younger than stem cells collected from bone marrow; therefore, the cell s structure and functions are not compromised simply because they have not been exposed to potentially harmful environmental factors like chemicals or viruses. In correlation with its convenience, HUCB that is taken at birth can be used in the future by its former host with no risk factors in other words, if you are using your own cord blood cells, your body will not reject them. In the past, HUCB was considered post-pregnancy waste, but now, doctors and researchers strongly suggest the storing and preserving of HUCB to the parents of newborns. 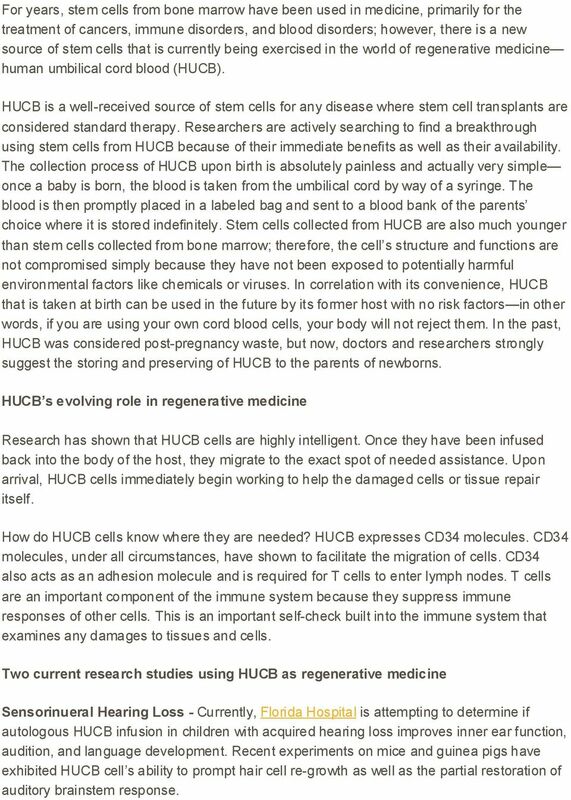 HUCB s evolving role in regenerative medicine Research has shown that HUCB cells are highly intelligent. Once they have been infused back into the body of the host, they migrate to the exact spot of needed assistance. Upon arrival, HUCB cells immediately begin working to help the damaged cells or tissue repair itself. How do HUCB cells know where they are needed? HUCB expresses CD34 molecules. CD34 molecules, under all circumstances, have shown to facilitate the migration of cells. CD34 also acts as an adhesion molecule and is required for T cells to enter lymph nodes. T cells are an important component of the immune system because they suppress immune responses of other cells. This is an important self-check built into the immune system that examines any damages to tissues and cells. Two current research studies using HUCB as regenerative medicine Sensorinueral Hearing Loss - Currently, Florida Hospital is attempting to determine if autologous HUCB infusion in children with acquired hearing loss improves inner ear function, audition, and language development. Recent experiments on mice and guinea pigs have exhibited HUCB cell s ability to prompt hair cell re-growth as well as the partial restoration of auditory brainstem response. 4 Primary outcome measures focus on the safety of autologous stem cell infusion, while secondary outcome measures focus on the restoration of damaged cells and tissues. Autism - Sutter Health is actively recruiting participants, ages 2 through 7, to participate in a study that is attempting to evaluate the efficacy of one infusion of stem cells from autologous HUCB in patients with autism over six months after infusion as measured by changes in expressive and receptive language. Primary outcome measures include a change in language as measured by the Receptive One-Word Vocabulary Test and the Expressive One-Word Vocabulary Test. Secondary outcome measures focus on improved behavior and learning, change in symptoms of autism, and a change in serum values. 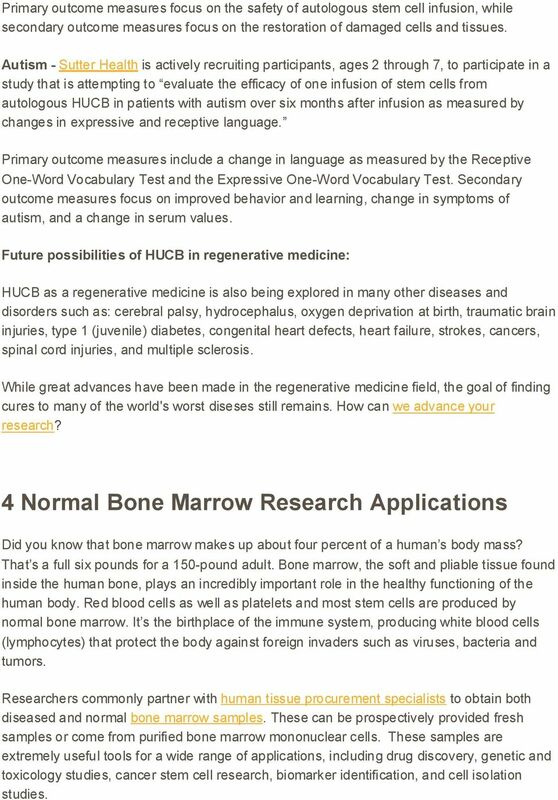 Future possibilities of HUCB in regenerative medicine: HUCB as a regenerative medicine is also being explored in many other diseases and disorders such as: cerebral palsy, hydrocephalus, oxygen deprivation at birth, traumatic brain injuries, type 1 (juvenile) diabetes, congenital heart defects, heart failure, strokes, cancers, spinal cord injuries, and multiple sclerosis. While great advances have been made in the regenerative medicine field, the goal of finding cures to many of the world's worst diseses still remains. How can we advance your research? 4 Normal Bone Marrow Research Applications Did you know that bone marrow makes up about four percent of a human s body mass? That s a full six pounds for a 150-pound adult. Bone marrow, the soft and pliable tissue found inside the human bone, plays an incredibly important role in the healthy functioning of the human body. Red blood cells as well as platelets and most stem cells are produced by normal bone marrow. It s the birthplace of the immune system, producing white blood cells (lymphocytes) that protect the body against foreign invaders such as viruses, bacteria and tumors. Researchers commonly partner with human tissue procurement specialists to obtain both diseased and normal bone marrow samples. These can be prospectively provided fresh samples or come from purified bone marrow mononuclear cells. These samples are extremely useful tools for a wide range of applications, including drug discovery, genetic and toxicology studies, cancer stem cell research, biomarker identification, and cell isolation studies. 5 Here are four interesting applications for bone marrow specimens: Elevated white blood cell disease When there are excessive levels of white blood cells, also known as eosinophils, disease can result. Acurrent clinical study is collecting normal bone marrow and blood samples to compare to samples from patients with elevated eosinophils. The study administrators collect blood and bone marrow samples from normal volunteers who meet standard blood donor criteria According to the published protocol, some of the collected samples will be used for genetic testing or future research. Inflammatory bowel disease (IBD) IBD is a vexing disorder thought to be caused by an immune response to the body s own intestinal tissue; it causes a range of disabling symptoms and there is as yet no cure, though therapies do exist that help relieve symptoms. 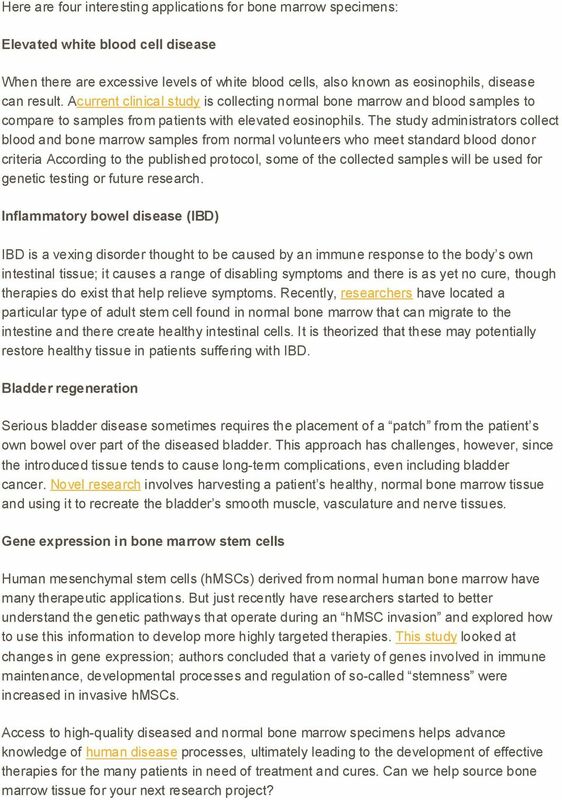 Recently, researchers have located a particular type of adult stem cell found in normal bone marrow that can migrate to the intestine and there create healthy intestinal cells. It is theorized that these may potentially restore healthy tissue in patients suffering with IBD. Bladder regeneration Serious bladder disease sometimes requires the placement of a patch from the patient s own bowel over part of the diseased bladder. This approach has challenges, however, since the introduced tissue tends to cause long-term complications, even including bladder cancer. Novel research involves harvesting a patient s healthy, normal bone marrow tissue and using it to recreate the bladder s smooth muscle, vasculature and nerve tissues. Gene expression in bone marrow stem cells Human mesenchymal stem cells (hmscs) derived from normal human bone marrow have many therapeutic applications. But just recently have researchers started to better understand the genetic pathways that operate during an hmsc invasion and explored how to use this information to develop more highly targeted therapies. This study looked at changes in gene expression; authors concluded that a variety of genes involved in immune maintenance, developmental processes and regulation of so-called stemness were increased in invasive hmscs. Access to high-quality diseased and normal bone marrow specimens helps advance knowledge of human disease processes, ultimately leading to the development of effective therapies for the many patients in need of treatment and cures. Can we help source bone marrow tissue for your next research project? Stem cells possess 2 main characteristics: Sources of pluripotent stem cells: -Long-term self renewal. -The inner cell mass of the blastocyst. STEM CELL FACTS. The ISSCR is an independent, nonproft organization providing a global forum for stem cell research and regenerative medicine. What are Stem Cells? How can they be used in medicine? Stem Cells. 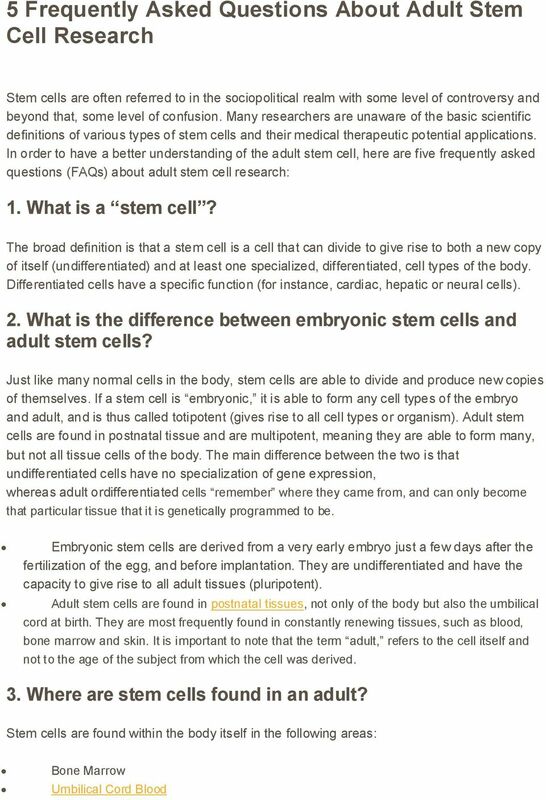 Part 1: What is a Stem Cell? Should Stem Cells Be Used To Treat Human Diseases? tem ells /background /information Stem cell research Copyright 2007 MRC Centre for Regenerative Medicine, Institute for Stem Cell Research /02 /information Table of contents Page 01. What are stem cells? AssureImmune. Cord Blood: For Something That Precious, Bank with the Best. Important Facts for When You re Expecting. AssureImmune. Chiang 1 Stem Cell Research: Adult or Somatic Stem Cells Abstract Kelly Chiang Cluster 7 Dr. LeFebvre 07/26/10 Over the past few decades, stem cells have been a controversial topic in the scientific field. Briefing on the second reading of the Human Fertilisation and Embryology Bill, Monday 19 November 2007. 11111 This fact sheet describes the process of cloning and producing stem cells. It outlines the potential benefits, ethical challenges, and provides an overview of the current policies governing the technology. Saving your baby s cord blood could save your baby s life Discover the power of cord blood Cord blood is the blood that remains in your baby s umbilical cord following birth and after the cord is cut. Human Embryonic Stem Cell Research Frequently Asked Questions and Fact Sheet Stem Cell Science Basics What are stem cells? Stem cells are naturally occurring cells that are not yet fully differentiated. The Therapeutic Potential of Human Umbilical Cord Blood Transplantation for Neonatal Hypoxic-Ischemic Brain Injury and Ischemic Stroke a,b* b,c a a b b b b a b a b c 430 Wang et al. Acta Med. Okayama Vol.